Caroline Walter was the daughter of Walter Walter and Ann Leach Penny of Babcary, Somerset, England. Caroline Walter aged 9 is listed in the 1851 census at Greenhill Farm, Foddington, Babcary with her parents. In 1861 she was living in Broad Street, Somerton where she was a draper’s assistant at the shop of Joseph Williams (?on the corner of New Street). Her grandmother Lucy Penny (1789-1871) lived next door and is described as a proprietor of house(s). In 1871 Caroline was a draper's assistant in the household of Henry Fernie in Warwick Street, Leamington. 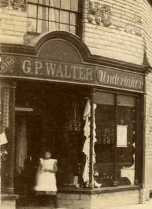 By 1881 Caroline was living with her mother and brother Phillip in Somerton and is described as a draper/grocer. In 1883, Kelly's Directory describes her as a milliner, draper and grocer in West Street, the purveyor of 'a choice assortment of fancy goods'. 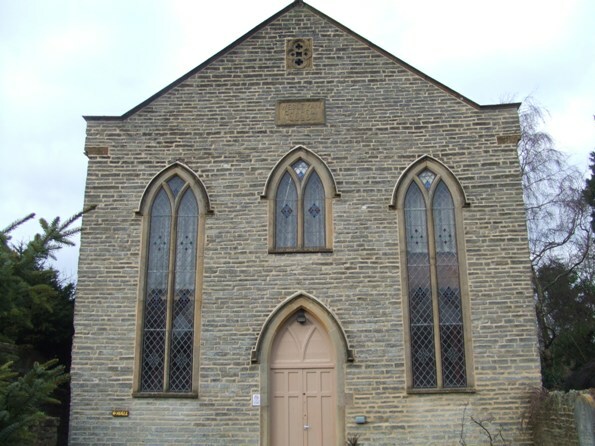 Caroline married William Whittle (1837-1903) at the Wesleyan Chapel, Somerton on 22nd December, 1885 witnessed by her brother Gaius Penny Walter and sister Susan (Susannah Walter). In 1891 they were living in Babcary next to the schoolmaster, William was described as a farmer and they had a nephew, Fred Walters aged 11 staying with them, born Super Ely in Wales (son of David Walter). In 1901 William was living alone. After his death in 1903 probate was granted to his brother John Whittle - value £438. The Whittle family had a long connection with Babcary and there were several Whittle/Walter marriages in the 18th and early 19th centuries, including Caroline's grandmother Mary Whittle (1756-1834) with William Walter. Caroline's husband,William Whittle was the son of Jacob Whittle, himself the son of James Whittle (1761-1835) (son of Richard and Sarah Whittle) who married Susanna Walter (1761-1840) (daughter of William Walter, 1718-1774 and Susanna Whittle, 1725-1771); Caroline's father Walter was the son of William Walter and Mary Whittle, William being the son of William Walter (1718). 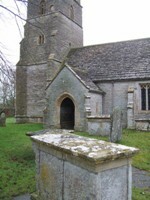 The Whittle chest tomb at Holy Cross Babcary was restored in recent years. William Whittle was the third of eight children born to farmer Jacob Whittle (1802-1870) born in Babcary and his wife Elizabeth Whittle (1813-1889). In 1881 William was farming at Church Farm, Babcary with his sister Sophia Whittle (1836-1903) as housekeeper. Next door at Fernleigh Lodge lived his mother and sisters Susan Whittle and Elizabeth Whittle, all described as gentlewomen. Susan Whittle probably died in December 1881 aged 44 years. In 1891 his sister Sophia was living with another brother, John Whittle who married Caroline Bengefield in 1869 and farmed in Wincanton district. Sophia died in 1903. In 1911 sisters Sarah H and Elizabeth Kathleen were living at Church Street, Babcary. Sophia, Jane Whittle (1838-1898) and Sarah Whittle (1847-1923) are commemorated in the churchyard of Holy Cross, Babcary.